I’m one block off of the beach on the upper floor of a beach town hotel. Looking right next door, I'm eyeing up the most elaborate, most expensive mansion in all of Sihanoukville. This isn't just one house, it’s a grand compound. The new luxury home is surrounded by high walls, and entered through an elaborate gate. Not that I can get in, that won't happen. That's because this beach home belongs to none other than Hun Sen, Prime Minister of Cambodia. It's only one of his many mansions across the country. Hun Sen has come a long way. As the long time Prime Minister (and dictator) he's now the richest man in the country! That's ironic, since he had sworn off money during the communist era, when he began his rise to power as a radical Khmer Rouge soldier. He's not very fearful looking. His big glasses don't quite disguise that he has a glass eye; a war injury from fighting near Phnom Penh in 1975. After the Khmer Rouge victory, this communist chameleon was posted to the eastern region. There he rose to be a regimental commander, covering Kratie to Kampong Cham. But that didn't last; Hun Sen fled for his life in 1977, fearing the purges that killed so many other eastern commanders. He defected to Vietnam, where he joined up with the Vietnamese military. Soon he returned to Cambodia with his new masters, helping them to kick out his former Khmer Rouge buddies. There is suspicion among Cambodians that Hun Sen is merely a puppet. “Hun Sen was installed by the Vietnamese,” a street vendor once told me. King Sihanouk himself agreed. He called Hun Sen the, "one eyed lackey of the Vietnamese". 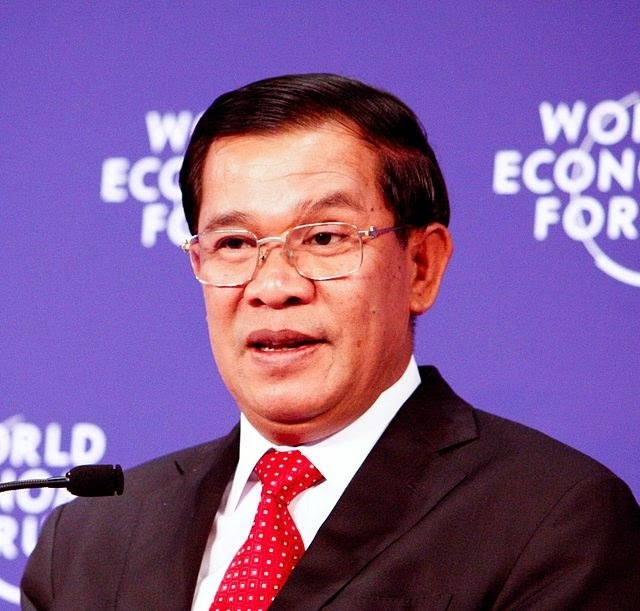 With the Vietnamese occupying most of Cambodia for the next decade, Hun Sen was the puppet government's first Foreign Minister, and later became Prime Minister in 1985. Then the United Nations entered the scene, bringing democratic elections. In the only fair election that Hun Sen competed in, he lost. Not content to fade away gracefully, he refused to vacate power, throwing the country into political crisis. A UN brokered 'compromise' left Cambodia with two co-Prime Ministers; Hun Sen, and Prince Norodom Ranariddh, the real winner of the elections. Not content to share power either, he led a coup d'etat in 1997 against the Prince. Sadly, Hun Sen's troops prevailed. Over 100 Khmers were killed as his army attacked troops loyal to the Prince, took over the capital, and arrested and executed political opponents. The prince fled to exile in France. Although many Khmers still support Hun Sen and his political party, one thing is clear: today he is the most hated man in Cambodia. I recall one afternoon back in Phnom Penh, when I saw Hun Sen’s motorcade speeding down Monivong Blvd. His vehicles were black SUV’s, all with tinted windows. Policemen blocked off all traffic. I've seen motorcades of top politicians before in Vietnam, and in the USA. Normally they drive calmly and slowly, but Hun Sen's convoy was different. His motorcade came flying down the street like madmen; it was as though he expected someone to open fire on him at any second. Here was a man running scared. Hun Sen must have far more enemies than I thought. 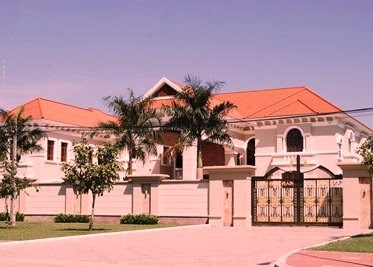 Knowing Hun Sen and his family's reputation for corruption, I look at the opulence of his beach town mansion not with awe, but disgust. Cambodia has some of the world's worst poverty, and I wonder, how many schools could have been built with the dirty money he used to build this mansion? In 2012 Transparency International's annual Corruption Perception Index ranked Cambodia 157th out of 174 countries in the world. They were tied, with the equally disgraceful governments of Angola and Tajikistan. US Ambassador Carol Rodley stated that Cambodia was losing $500 million a year to corruption. Not surprisingly, the Prime Minister's government denies it. My hotel is so close to Hun Sen's fence, that I could leap across from the hotel walkway right onto the rooftop of one of his buildings, and do some mayhem. There are no guards in view, could I really pull it off? But I'm not that radical, and I'm only visiting Sihanoukville. I don't want to be arrested, and become another of Hun Sen's nameless political prisoners.